6 Easy Ways to Improve Customer Experience, Guaranteed. No matter what industry you’re in, your business needs to invest in your customers. And the best way to invest in them is by ensuring that they have a pleasant experience with your brand. A good customer experience can benefit your business in a number of ways. For instance, a customer could talk about their wonderful experience with your brand and recommend you to their friends and family. If you consistently deliver exceptional service, it can also boost customer loyalty and their trust in your brand. At one time or another, you’ve probably landed on a website that was extremely sluggish. How did that make you feel? Chances are that you felt some kind of frustration and may have even left the page before finding what you were looking for. According to Radware, visitors will abandon your webpage if it takes longer than 3 seconds to load. Find out how long your website takes to load using the Pingdom Website Speed Test. The tool gives you detailed information about your website performance and gives you suggestions about where you can make improvements. 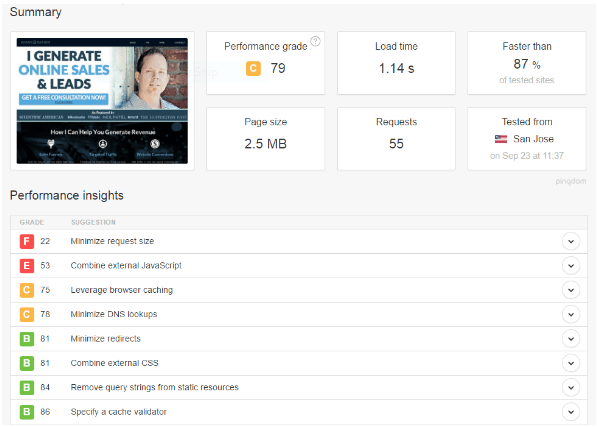 If you’re using WordPress, you can also check out the previous DataDial post by Dan Bruce on speeding up your WordPress site. If a website visitor can easily find what they’re looking for, there’s little room for a bad customer experience. If they’re having a tough time navigating your site, however, it could give them a bad impression of your business. Not only will they abandon your site, they may never visit again. To ensure that your site visitors can easily find what they need on your site, simplify the navigation and make sure the search box is prominently displayed. So even if they can’t find the right info through the drop-down menu, they can easily enter a search term and find what they need. 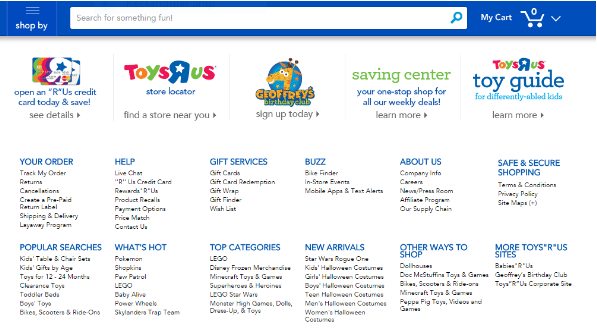 Toys “R” Us does a great job of this by adding a prominent search bar in addition to neatly categorizing their products. This is especially crucial for ecommerce websites because customers need help finding exactly what they want from your catalog of hundreds, (or thousands), of products. 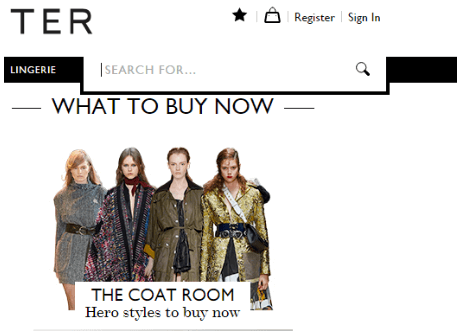 If you’re worried about compromising on site design, you can also try using an expandable search form like Net-a-Porter does. Here’s how it looks when visitors are navigating other parts of the webpage. It’s prominent enough without taking up too much space on the page. Once you click on the search field, it expands to a bigger field so that you can easily enter your search term and find what you’re looking for. What if customers can’t find what they’re looking for even through the search field? What if they have some questions about the product they have recently ordered? It’s important that your website visitors can get through to you easily if they need help with something. They should be able to access customer support and technical support easily if you’re planning to improve their experience. Make sure your website is enriched with useful FAQs that are easily accessible in case visitors need answers to common questions. You should also implement a system through which they can quickly get help for their issues. First of all, your contact information such as email address and phone number should be clearly visible. You can also try adding an interactive live chat window so visitors can get help in real-time. 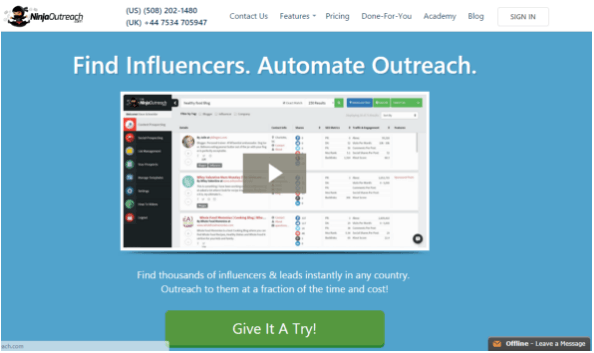 Take a look at Ninja Outreach for example. They clearly display the contact information at the top of their page so customers can easily give them a call. 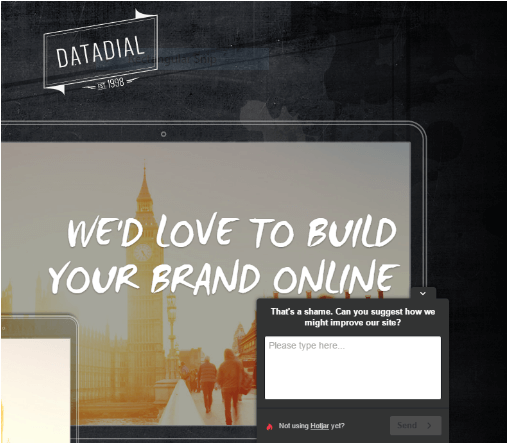 Additionally, they also add a chat window so website visitors can get assistance in real-time. If the chat is offline, visitors can still leave a message for customer service to get back to them. What are your customers thinking? You can’t rely solely on assumptions when determining what your site visitors want. Feedback from your customers is an invaluable resource to help you deliver better customer experience. This will help you understand where you’re going wrong and what you can do to further improve the quality of service you provide. There are plenty of tools that can help you conduct accurate surveys of your customers’ opinions. Survey Monkey, for instance, helps you send out questionnaires and conduct a survey of your target market. Additionally, you can add plugins like Hotjar to your website to collect opinions and feedback from site visitors. Here’s an example of its use on DataDial, where visitors can answer whether or not they found what they’re looking for. If you select “No,” the plugin gives you an empty field to enter your feedback. 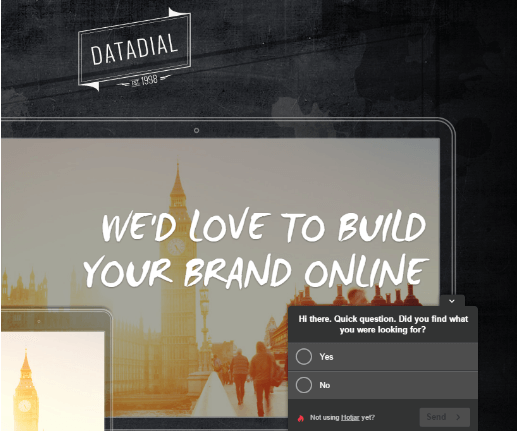 DataDial asks visitors what they can do to improve their website. Collecting such useful info will give you a better idea what your visitors are looking for and what changes you can implement to improve their experience on your website. A customer is trying to buy something from your site. Your job is to make it as easy as possible for them to complete their purchase. It only takes a few seconds for people to change their minds about a purchase. So you need to make sure that doesn’t happen by providing a quick and simple checkout process. Avoid overloading the checkout page with unnecessary form fields. For instance, requiring customers to enter their physical address in the case of SaaS products may not be so practical. Only ask for information you genuinely need for people to complete their purchase. Adding an unnecessary step can also complicate the checkout process. For example, requiring compulsory signups may result in customers abandoning their cart. But you can make it simpler by giving them the option to signup using their social media accounts with just one click. 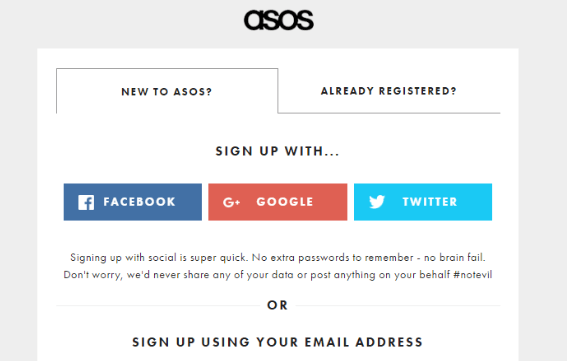 Asos gives multiple signup options so it’s easier for customers to become part of their network. Your staff members are the face of your brand and you need them to deliver exceptional customer service. They’re one of the most valuable resources you can ever invest in. So equip them with essential knowledge and enrich their experiences through informative training sessions, preparing them to help customers every step of the way. It’s also crucial that they feel at home within the organization so that they feel compelled to do their part for the brand. This will work much more effectively than pressuring them to meet certain metrics and goals. Online retailer Zappos is well-known for their great customer service. The brand stays consistent with their call center customer service as well. They don’t measure employee performance on standard metrics like time to close, call time, etc. Instead, employees just have to focus on building a connection with callers so as to turn them into repeat customers. This takes away a lot of pressure from the employees, encouraging them to deliver better service. You now have six new ways to improve your customer service and guarantee a positive experience for your customers. Are you looking for expert advice on how to make your customers stay on your site and convert? Maybe you need some help further improving their experience to boost customer loyalty? Feel free to get in touch with me.